At the beginning of September 1944, the 458th flew seven combat missions, including two AZON sorties, one on the 1st and one on the 13th. From September 12th until the end of the month, the 458th was removed from combat operations in order to fly fuel to General George Patton’s Third Army in France. Patton’s advance had been so swift that the units in the land supply line were having a difficult time keeping his tanks and vehicles fueled. 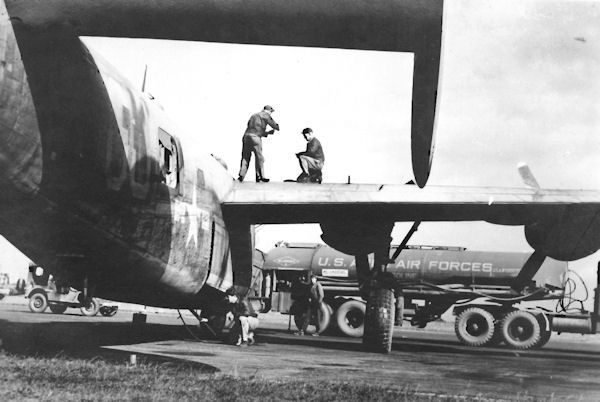 The 458th was one of several 2nd Bombardment Division groups to fly these missions, given the codename: Operation Truckin’. 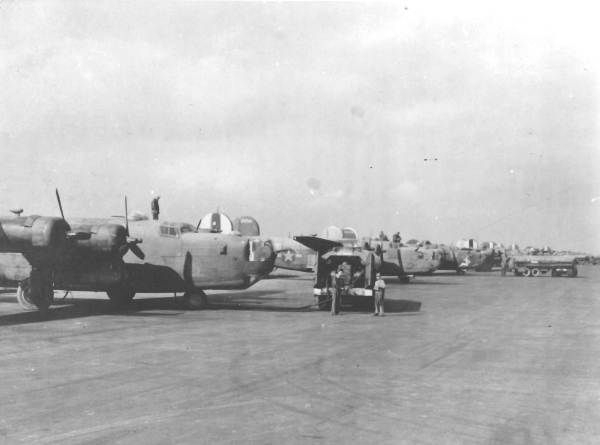 It is believed that the entire 96CBW (458BG, 466BG, and 467BG) was relegated to this task, with additional aircraft coming from several 2BD groups. Crews received no mission credit for these flights from England into France, although due to the amount of fuel on board, many of the airmen considered them more dangerous than some of the combat missions they had been on. The group lost two crews during this time: on September 20th Lt Herbert H. Humke crashed his fully fuel laden B-24 on takeoff from Horsham with all aboard killed; and on September 23rd, Lt George J. Koehn was reported missing from the return flight from St. Dizier. It was much later that the group learned that they had strayed too close to German positions and had been shot down, with only one man surviving as a PoW. Four other aircraft were damaged so badly by the conditions at these newly captured airfields in France that they had to be written off as Category E (salvage). There were a few injuries to crew members in these latter incidents (see Lt Kermit A. Wagner crew page). 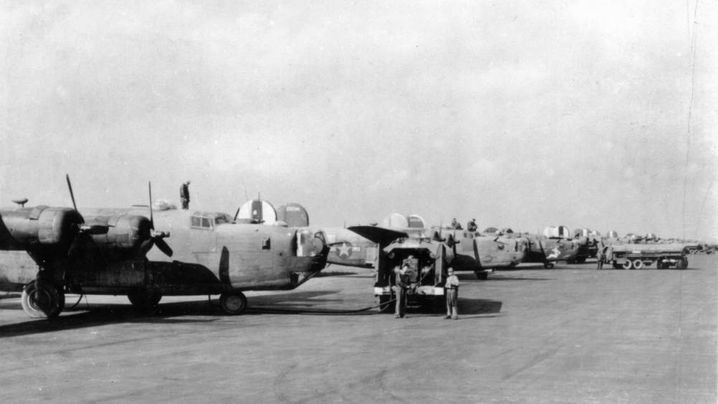 B-24 aircraft of the 2d Bombardment Division carried on supply operations during the period 29 August to 30 September 1944, flying from various bases in the U.K. to terminals at A-50C, A-71, A-64, A-78 and B-51. Initially rations, medical supplies, and Jerry cans were loaded at Aldermaston, Membury, Ramsbury, Welford, Greenham Common, and later at Beaulieu and transported to A-500 and later A-71. 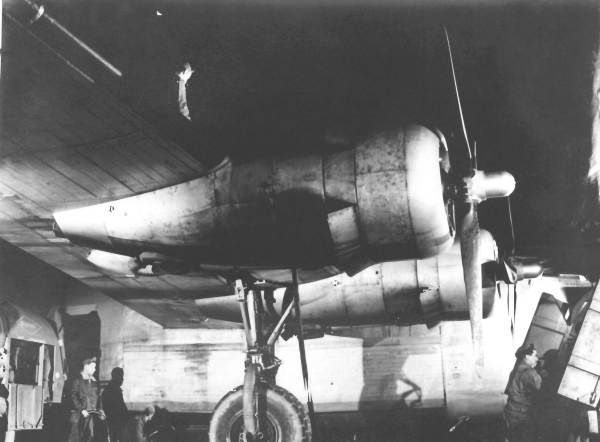 During this phase of operation, aircraft were equipped with bomb bay platforms. This phase was definitely accomplished the hard way, because maintenance, servicing, messing, housing, briefing, weather, communications, etc., at Beaulieu were a duplication of established facilities available at 2d Bombardment Division bases. Loading personnel were few and at times unavailable. On numerous occasions aircraft were dispatched from home bases to Beaulieu by order of Eighth Air Force, only to find that there were no supplies to be loaded. 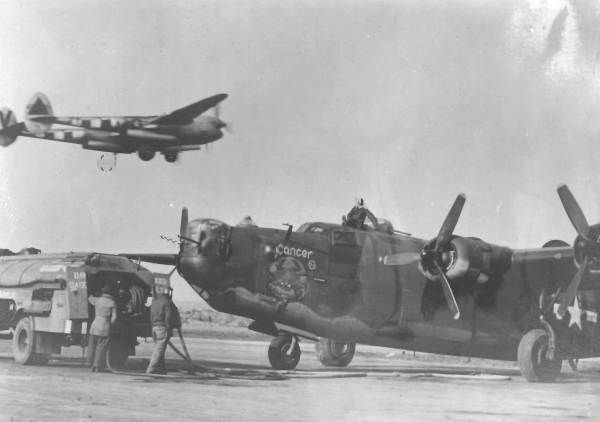 A second phase of supply operations was carried out from 2d Bombardment Division bases direct to terminals in France, using B-24 aircraft equipped to carry bulk gasoline. A small control and maintenance detachment from this Division was placed at each terminal and this phase ran more smoothly. Terminals in use were congested and all had operational fighter aircraft based on the strip. During the initial phase of supply operation liaison was not set up and it was impossible for this Headquarters to get any detailed information on the project other than daily commitments from Eighth Air Force. During the second phase of operations, liaison was established with Headquarters, 9th Air Force, Advanced, Communications Zone and 12th Army Group. The importance of the early establishment of direct liaison between the hauling units concerned with receiving supplies cannot be over-emphasized. It is felt that, had the liaison between this Headquarters and the organizations mentioned above been accomplished at an early date, the whole operation would have been handled more efficiently and with better satisfaction to all concerned. The problem which arose in the handling of packaged freight revolved entirely around the organization at the advance base. 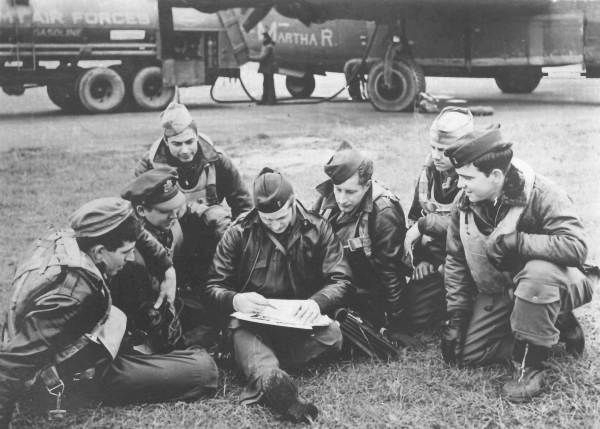 It was the responsibility of Communication Zone Headquarters to provide personnel for the loading of aircraft at USAAF Stations Ramsbury and Welford, and RAF Station Beaulieu. These bases were also supposed to have been set up to take care of the necessary housing and messing for the aircrews of the 2d Bombardment Division. At no time was there personnel available to load more than ten (10) planes per hour. It was necessary for this Division to send its own operational and maintenance detachment to the advance bases and to actually set up messing and provide living accommodations at Beaulieu. Had proper liaison been established, directly between this Headquarters and the responsible section of Communication Zone, it is felt that many of the inconsistencies could have been quickly ironed out and responsibility established. The difficulties of liaison, together with the contributor inadequacies of communications leads this Headquarters to recommend strongly that any similar operation should be carried out with delivery of cargoes directly to the home base, eliminating the need of advance bases. 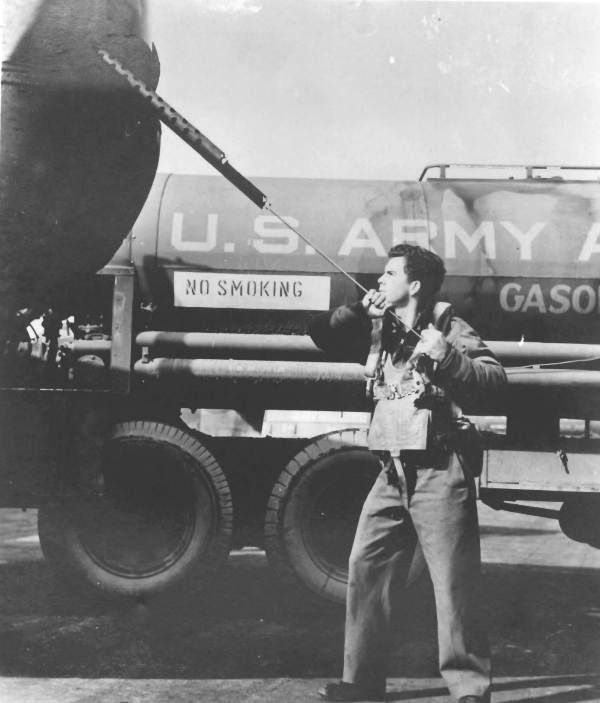 Petroleum Board was charged with the responsibility of providing 70,000 imperial gallons of 80 octane fuel per day to each of the three stations of this Division and 120,000 imperial gallons per day to USAAF Station Harrington. Responsibility for delivery to the base rested with Petroleum Board. 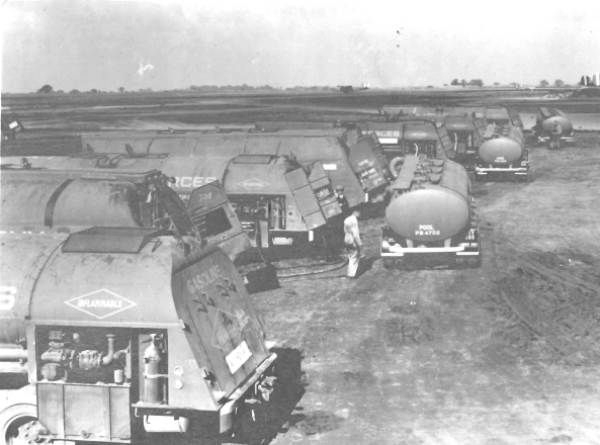 Our experience indicated that the one important organizational factor at the home base was the proper establishment of an organization to supervise the receipt, the storage, and the delivery of the 80 octane fuel, providing thereby a means of constant control of the flow into the station based upon hour-to hour usage. It was necessary for units of this Division to provide personnel at Terminal Stations to carry out the operational, communications and housekeeping details. a. Operational personnel consisted of Flying Control (including airdrome controllers), and an Operational Section of two officers and two clerks. b. Communication personnel consisted of one officer and three enlisted men. c. Housekeeping personnel consisted of approximately two officers and ten men, including cooks and orderlies. It was necessary also to furnish and transport tentage, cooking equipment, cots, blankets, water storage facilities, firefighting equipment, and transportation (2 Jeeps) from the home base. Division Headquarters maintained operational control only insofar as detailing units to handle the project. Briefing (weather and control) and dispatching were exercised by the Wing designated. Movements, clearance and the establishment of corridors were handled by this Headquarters. 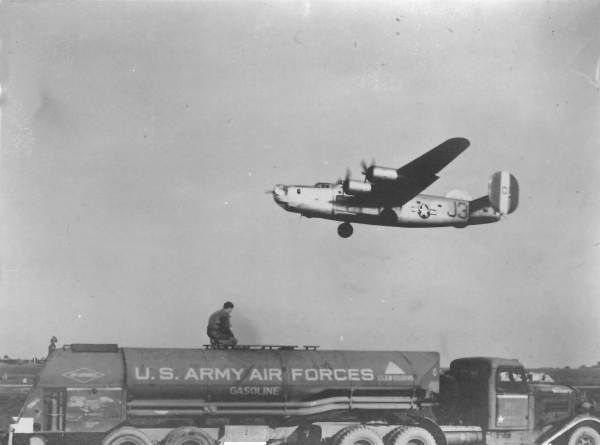 The B-24 airplane did not present any difficult problems in the transportation of bulk gasoline. The conversion adopted was dictated by the equipment available in the U. K.; however, a more desirable loading could have been formulated with more bomb bay tanks available. 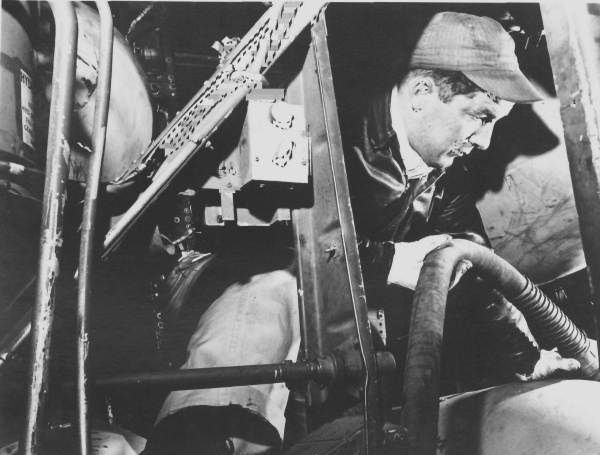 Previous to the installation of additional fuel-carrying tanks it was necessary to reduce the gross weight of the airplane to provide for the maximum amount of gasoline to be carried and not exceed the gross weight limitation for a safe landing. To accomplish the reduction in weight, it was necessary to remove the ball turret, bomb sight and bomb sight stabilizer armor plate, ammunition cans, ammunition, waist guns and loose equipment throughout the airplane. Total weight on landing varied from 57,000 to 59,000 lbs. In addition to the reduction in gross weight, a more favorable C.G. [center of gravity] location was obtained. These aircraft were better suited for cargo work by virtue of having had combat equipment (turrets, guns, etc.) removed. 2 wing tip tanks which are standard airplane equipment 450 U.S. Gal. 1 front bomb bay tank 390 U.S. Gal. 1 P-47 fighter belly tank in the front bomb bay 108 U.S. Gal. 4 P-47 fighter belly tanks in the rear bomb bay 432 U.S. Gal. 1 P-38 fighter belly tank at the waist windows 165 U.S. Gal. 4 P-47 fighter belly tanks in the rear bomb bays 432 U.S. Gal. 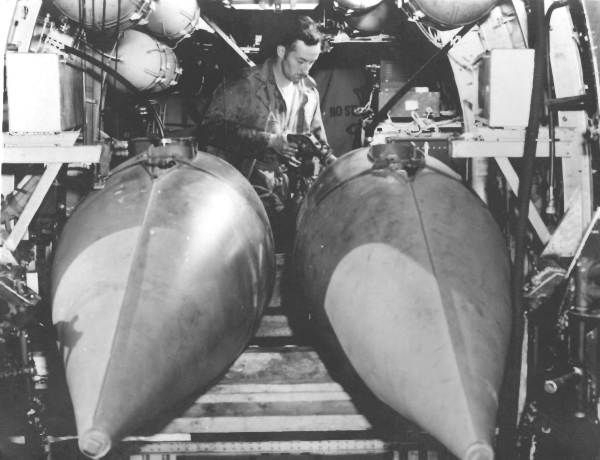 3 bomb bay tanks 1170 U.S. Gal. 2 P-47 fighter belly tanks in rear bomb bay 216 U.S. Gal. d. Fifty per cent of the aircraft used loading scheme (1), 25% used loading scheme (2) and 25% (carpetbagger aircraft) used loading scheme (3). e. Metal fighter belly tanks were used throughout. f. A more desirable loading would be to use four bomb bay tanks, eliminating the use of fighter belly tanks. This would provide a total capacity of 2010 gallons (wing tip tanks included). g. In any event, the maximum number of bomb bay tanks should be used. The use of multiple fighter belly tanks presented a pumping problem in that the suction hose had to be changed too frequently. Air locks in the lines and pipe line system resulted. If fewer tanks with greater individual capacity had been used, the problem of air locks would have been greatly reduced. h. There was no problem involved in the actual installation of either bomb bay tanks or the belly tanks. The fighter belly tanks adapted themselves very well to the modification for mounting on the bomb racks and could very easily be removed from the airplane when once installed. i. It may be advisable to connect the bomb bay tanks to the cat-walk transfer pump in the event adequate unloading facilities are not available. 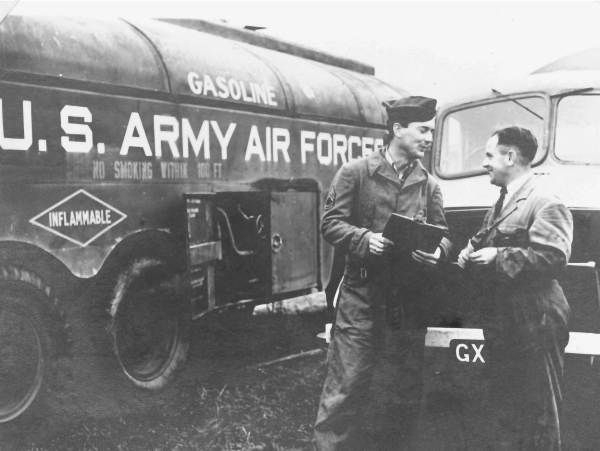 Equipment problems at the bases were largely concerned with the temporary storage of 80 octane motor fuel. 100 octane underground storage facilities could not be used because of the bottleneck which would be created by limited unloading and loading facilities into and out of the underground storage and because of the continued requirement of this capacity for aircraft fuel. To remedy the storage and handling difficulties on the stations, it was necessary to furnish each station within the Eighth Air Force. 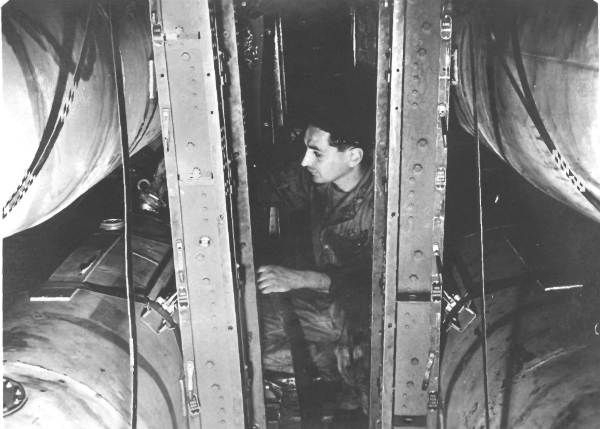 With the use of multiple fighter belly tanks, the loading crews were confronted with the problem of changing hose[s] frequently. It is felt that the loading could be greatly accelerated if fewer tanks with a greater capacity were used as recommended. Due to the exigencies of the situation the immediate supply problem was critical. Sufficient airplanes could be dispatched from the home base to make good the commitment; however, adequate unloading facilities for handling the gasoline were not available at the terminal stations. Eventually, conditions were improved and unloading was being carried out satisfactorily. A-71, A-73, and A-64. At these terminals, the first installations consisted of three unfolding pumps, each fitted with three or four unloading suction lines. These pumps were separated so as to unload one aircraft each at a time. Subsequently, these facilities were rearranged so that by manifolding all pumps together, more aircraft could be handled at one time and greater flexibility was obtained. Under both of these arrangements, the unloading pumps discharged into a bulk storage tank, from which cans were filled independent of the aircraft unloading operation. B-51. At this terminal, a combination of small portable power pumps and hand pumps were used. Also, the gasoline was pumped directly into 5-gallon cans. The above pumping equipment was transported in trucks to the aircraft wherever it may have been parked. This system proved most unsatisfactory and inefficient. Airfield control facilities (HF and VHF). a. Navigational aids (radio beacons and/or HF or VHF homing stations). b. Net control station for air-ground liaison and control radio net. c. Net control station for point-to-point radio link with advanced bases. d. Normal telephone and teletype facilities. a. HF W/T liaison facilities. b. HF R/T control and command facilities. c. VHF R/T control and command facilities. d. Navigational aids – radio compass and/or radar facilities such as GEE or Loran. The requirements of paragraph (2) and (3) above are or can be fulfilled by the use of normal station, group and squadron equipment as authorized for heavy bomber stations and units in the United Kingdom. The requirements of paragraph (1) can be fulfilled by using group and squadron equipment, but the essential consideration is to use items which are air transportable. Field telephone and radio equipment has proven entirely adequate. Such items as command set SCH 274N and VHF set SCR 522 are well suited for aircraft control purposes when provided with suitable power supplies. SCR 188 sets are entirely satisfactory for radio beacons (with tuning units modified according to frequency) and for point-to-point purposes up to 300-500 miles range. Net control stations at home bases or Headquarters will normally be SCR 299/399 sets. a. Allocation of suitable radio frequencies, call signs and cryptographic systems for air-to-ground and point-to-point radio communication. b. Earmarking and preparation of advanced base equipment and operating and maintenance personnel on each station. c. Preparation of signal operation instructions and standard operation procedures which can be issued as required. Training of communications personnel for operation under field conditions is of vital importance. Each individual officer and man must be well trained in the capabilities and limitations, operating and maintenance procedures, and emergency repairs of field communications equipment. Group and squadron training programs should stress this phase and in so doing will insure adequate preparation not only for special projects such as air supply operations, but for field based operations. Finally, the communications aspects of this problem are based upon the use of a minimum of equipment and personnel at advanced bases, all of which must be completely and instantly air transportable, and highly self-sufficient. Careful planning will ensure that group and squadron personnel and normal T/E communications equipment will perform satisfactorily. In addition to the recommendations that appear throughout the text above, it is felt that the following points should bear emphasis. 1. At the outset, it is imperative that direct liaison between the hauling units and consumer be established, eliminating as much as possible detailed work by higher headquarters. Responsibilities must be definitely established from the beginning. 2. Wherever at all possible, operations should be performed from the home bases of the units and use of advance bases avoided. 3. As soon as there is a prospect of use of bomber aircraft for hauling freight, immediate steps should be taken to round up all supplies and equipment which will be necessary to convert the aircraft. In the case of the bulk hauling of gasoline, every bomb bay tank available should be used. 4. It must be realized that heavy bomber aircraft cannot be operated into terminals with unsuitable runways and taxi ways. Five thousand feet of well-constructed runway is essential and maintenance personnel should be continuously available. 5. Adequate unloading personnel and equipment must be provided. Above text copied from a 2nd Bombardment Division document. While there is considerable text on hauling of freight, I have concentrated on the text concerning transportation of gasoline by the Division's Liberators. 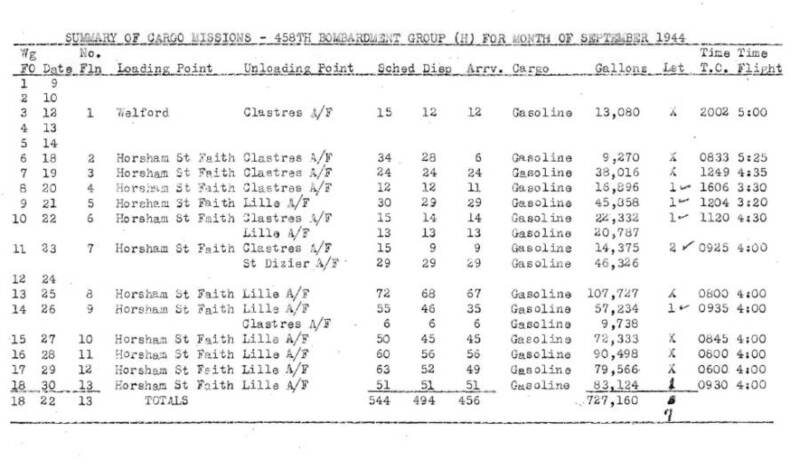 The document also has a section on the resupply of the ground forces during Operation Market Garden. Click for the full document. 8 20-Sep-1944 TR04 HSF CLASTRES 12 12 11 GASOLINE 16,896 1 1606 3:30 HUMKE CRASH ON T.O. 9 21-Sep-1944 TR05 HSF LILLE 30 29 29 GASOLINE 45,858 1 1204 3:20 BECHTEL (A/C 735) SALVAGE? 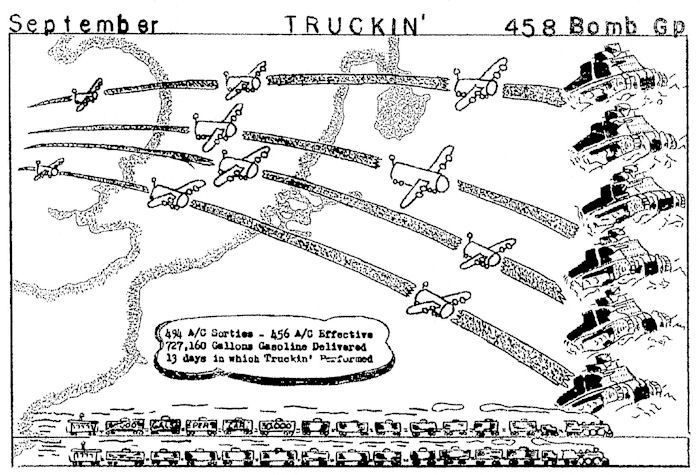 Truckin' - "Step by Step"
From "Army Air Forces in World War II, Volume III "
"Nevertheless, the air force transport agencies did make notable efforts on behalf of the ground armies. During September 1944, the 302d Transport Wing and a complete wing of Eighth Air Force B-24's helped haul the precious motor fuel which carried the American and British armies to the German border. The IX TCC, unfortunately, could not bring its fleet of transports fully to bear because from late August onward it was either awaiting or participating in the Arnhem-Nijmegen airborne landings. At CATORs request, on 9 September, the 302d suspended all airlift to the air forces, except for basic mail and passenger service, and devoted virtually all of its planes to the supply of Patton's army. At the end of September, when the Allied armies had come to a standstill on the western front, the 302d and the Eighth Air Force's B-24's returned to their normal duties. The total airlift to the ground forces during September was close to 40,000 tons, almost a fourth of it by the Eighth Air Force heavy bombers, which had been severely handicapped in their efforts by the lack of forward airfields capable of accommodating their heavy weight. Unfortunately, the tonnage lifted was not enough to keep the armies moving." Thank you Richard Downs for finding this information.